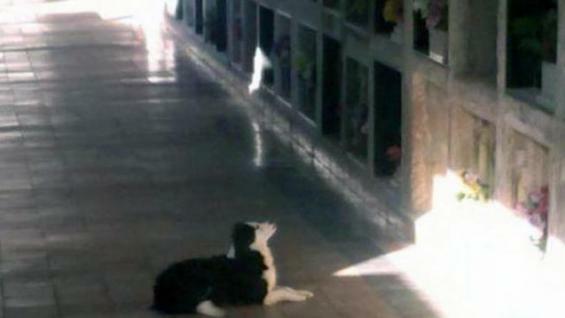 A dog mourning the loss of his owner visits the cemetery where the pet owner is buried for hours each day. At times the dog whines and cries for his human. 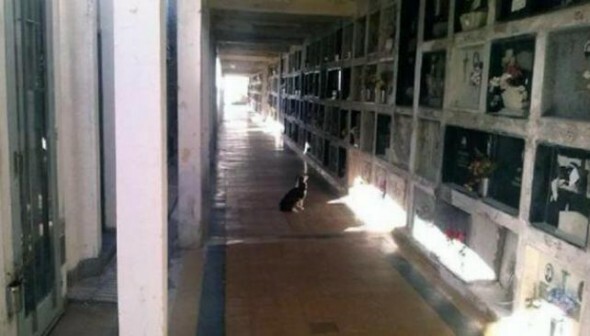 Everyday, a dog from Cañada de Gómez, Argentina, visits the cemetery where his owner is buried. Cemetery workers have captured pictures of this loyal four-legged friend coming to the graveyard every day. He stands in front of his owner’s last resting place and pays his respects. Witnesses say the dog visits his deceased owner for hours and at times the dog whines or cries for the human that is no longer with him. At the end of the day, the pet leaves the cemetery and comes back the next day. This dog is not the only one in the country that frequents burial grounds. There are two other known cases across the nation. Those other two dogs are known as Captian and Alicio. Nothing can compare to the love of a dog. So unconditional and tender. The World is so much a better place having dogs in it. I’m crying just looking at this picture. There is no other love like that of a dog. This is so sad and so sweet. Poor litte guy. This is so sad….I visit my dog’s grave every day I miss her so much…. that is beyond dedication it is pure love and loyalty. Like the dog’s story in Japan that keep waiting it’s owner at the sub train. Love and hate that movie!!! Hatchi!!!!! So moving!! I agree about Hatchi, It hurts my heart really bad. Can’t ever watch it again. I hope he has a place to live, poor baby. 🙁 Nothing is as loyal to you as your dog. .. I think I shall be cremated!! its sad and for the dogs sake he should be kept away and given love from someone else ,he is being traumatised !!!!!!! I do this for my dogs everyday. Heartbreaking, I hope this poor dog has a new owner. Dogs are God’s most amazing creation! That is so special and so sad at the same time. My heart breaks for this precious loyal baby. SO MUCH LOVE!! Bless it’s little heart. I wish this sweet baby could find a loving home with children so it could have a happy life again. God bless it. Our pets love us as much as we love them. wish human being could do same level of respect to other human.we should learn something from other creatures! Please find out and let us know if this poor loving pet has a new home. Special love for his owner. If he is a stray, someone have a heart and give him a loving home. He certainly deserves to have a forever happy home. Oh Dear God…I agree. You bring us these heartbreaking articles, yet, you always seem to forget to give us details about the status of these beautiful creatures. So, we walk away not knowing if this baby is OK…..pisses me off. I guess it’s my own fault for reading the story in the first place. But, still disappointing on the part of the author. Dat is love… I always say.. Animals are better dan Humans..
You got that right.. Animals would never send us to the pound or abuse us.. I am one of the good ones, I love my furry kids so much. Heartbreaking.proves dogs are the best people on the planet. Your Right Karen… I am an animal lover,& a pet sitter..
Why are all of these amazing “stories” happening in Argentina?? This is the 3rd separate one this week. Me too! I hope this good journalist finds out who is taking care of him. He can’t live long without food and water! this pup needs a hug! hope it gets out of too much missness on his parent soon. god bless his heart !! Sounds just like “Greyfriar’s Bobby”, a small dog in Scotland who visited his master’s grave every day until Bobby died. When that happened, the caretaker of the “kirk” (Scottish for graveyard) had Bobby (secretly) buried within the same graveyard (not really allowed). Visited there in 1997. Walt Disney immortalized Bobby with a movie back in 1961. Really touched my heart. What loyalty! and then people eat dogs. and some people say a dog is not human ? ?